Photo: Michigan State's 1957 team photo. Jack Quiggle is No. 21 and Johnny Green No. 24. Head coach Forddy Anderson is on the left in the white jacket. Below, Green with fans and Quiggle driving. For the third time Michigan State stands among a Final Four field that features a No. 1-ranked basketball team seeking to complete an unbeaten season with an NCAA title and record for most wins in a season. This year it’s No. 1 Kentucky with a mark of 38-0 in quest of 40-0. The Wildcats need victories in Indianapolis in the semifinals Saturday over Wisconsin and in the Monday title game over the Michigan State-Duke semifinal winner. In 1979, Michigan State and Earvin "Magic" Johnson met No. 1-ranked and 33-0 Indiana State with Larry Bird in the championship in Salt Lake City. The Spartans won in the highest rated television game of all-time. But in 1957, the Spartans faced the task of stopping No. 1 and unbeaten North Carolina out of the gate in the semifinals in Kansas City. The Tar Heels were 30-0 and in search of an unprecedented 32-0. 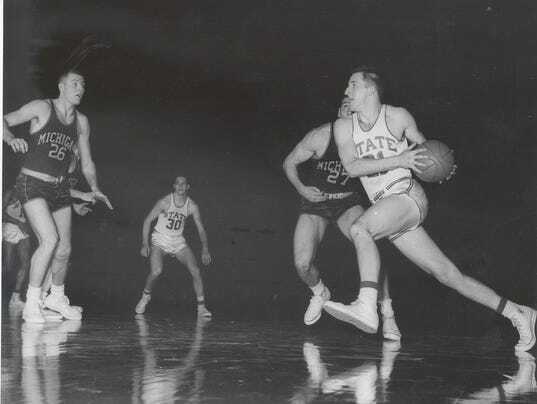 "We had some good players on that team, and we started to gel," said "Jumpin" Johnny Green, then a sophomore of the 1957 Spartans' late-season surge to the Final Four similar to the 2015 Spartans. "That's what happened to us. Once you win a game you want to win two and you want to win three. Everything fell into place." As fate would have it, Michigan State turned out to be the first of two North Carolina victims in epic triple-overtime battles before capacity crowds of 10,000 at Kansas City's Municipal Auditorium. The Tar Heels, led by national player-of-the-year Lennie Rosenbluth, defeated Michigan State 74-70 in 55 minutes and Kansas and Wilt Chamberlain 54-53 in another 55-minute marathon to finish perfection. The record withstood four 30-0 UCLA championship teams (1964, 1967, 1972, 1973) until Indiana matched 32-0 it in 1976. Bobby Knight's Hoosiers remain the last team to win an NCAA title with an unbeaten record. 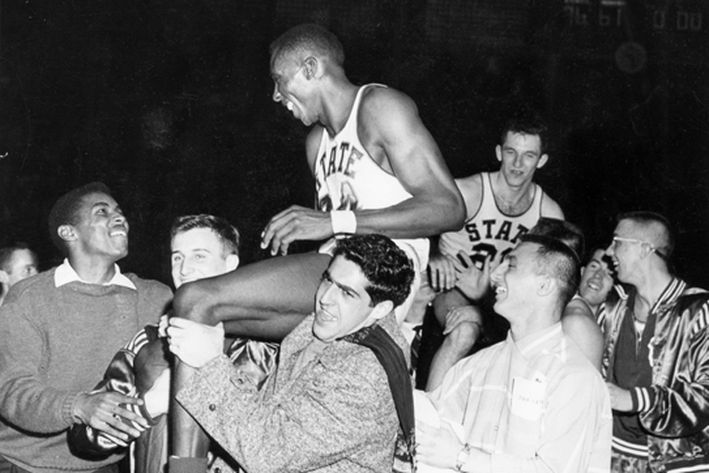 But the 1957 Final Four might just as easily have been Michigan State’s immortal stage. Michigan State’s Jack Quiggle hit a basket at the horn at the end of regulation that was waved off by the referees to set up the first overtime. On such narrow referee judgments at the buzzer are legends made or lost. Rosenbluth, 82, remains an immortal from that weekend. The late Quiggle is a forgotten name outside the annals of Michigan State basketball. The dramatic sequence at the end of regulation was set up by Green as he hit two free throws for a 58-58 tie with 1:57 to play. North Carolina went into a stall to set up a game-winning shot before calling timeout. In the frenetic final seven seconds following the timeout, Kearns took an inbounds pass and missed a 20-footer off the rim. Quiggle, the Spartans’ All-Big Ten player along with Green, grabbed the rebound and turned up court. The team’s leading scorer that season let fly a 50-footer from far side of the half-court line that banked through the rim. Michigan State had another chance to put the game away in the first OT. The Spartans led 64-62 as Green went to the free-throw line with 11 seconds to play. He missed and North Carolina's Pete Brennan scored with two seconds to force the second overtime. Rosenbluth says he has watched NCAA Tournament games ever since relating to players enjoying dramatic wins and feeling empathy for athletes suffering that crushed feeling he was spared. "You feel sorry for those guys," Rosenbluth said. "They have to live with it for a long time." The Michigan State-North Carolina game was unusually tight throughout. It was tied 29-29 at halftime and the same point totals in the second half accounted for a 58-58 regulation tie. The score was 64-64 after the first overtime and 66-66 after the second. Rosenbluth finished with 31 points. Green scored 11 points and pulled down 19 rebounds. Rosenbluth hasn’t changed his story with revisionist history all these years later. Asked if Michigan State could have beaten No. 2-ranked Kansas the next night as did the Tar Heels, Rosenbluth said the No. 11 Spartans were good enough as long as they played a similar strategy that North Carolina coach Frank McGuire employed. The Tar Heels slowed down the game and collapsed in the defense with four players in the lane to limit the 7-foot-1 Chamberlain touches. Chamberlain finished with 23 points and 14 rebounds, but he had to make 11 of 13 free throws for his total. Rosenbluth scored 20 points on 8 of 15 from the field. Rosenbluth played two NBA seasons as a first-round draft pick. He is a retired school teacher and coach that is a regular at North Carolina basketball games and frequent guest on radio. The legendary Dean Smith joined McGuire’s staff two years later and eventually succeeded McGuire. "Frank first met Dean on that trip to Kansas City when Dean was coaching at Air Force," Rosenbluth said. "The championship game was televised in North Carolina for the first time. The whole state watched, whether they were for us or against us. The next year they started the ACC Game of the Week on TV. There were a lot of repercussions from that Final Four. That changed the mentality of the state from football to basketball." Today, of course, Quiggle's shot would have been reviewed. Green has lived long enough to see technology allow for such a review. He will be watching the Spartans in their ninth Final Four -- and seventh under head coach Tom Izzo -- as he always does. Green made sure to mention he has appreciated the respect he receives from Izzo and the program when he has returned to campus. The Spartans retired his No. 24 jersey, named their rebounding award for him and inducted him into the school’s Hall of Fame.